choir croak out them goodies: Wireheads to the rescue! It's been another devastating week for the U.S., and so we find ourselves once again looking to Australia for comfort, and music in which to escape the now-constant reminder that we haven't yet sorted ourselves out. Adelaide's Wireheads are a lovely group of weirdos whose songs show a good deal of patience; they're a nice combination of Suburban Lawns, the Fresh and Onlys, and Swell Maps, the sort of group that Gen X's misfits would've embraced and who probably would've belonged in Los Angeles thirty years ago. 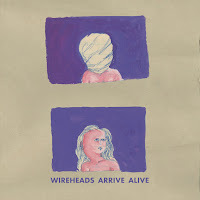 Less than a year after releasing their second record, made with perpetual weirdo Calvin Johnson, they've got Arrive Alive, a wacky adventure that boasts twenty musicians, two of whom play bicycle wheel. This is a great, organized mess of saxophone and improvisations and beginning guitar abilities and shouty exclamations and all the things a band should be fearless enough to throw into the mixing pot.